The fastest way to deal with the uncertainties of adulthood is to remove them. That’s what Kyndra’s village have done. Every year, the teenagers who come of age step into a room with the village relic. It shows them their new name and their future and they leave as adults with a certain future and no fear of any surprises. The daughter of a local tavern owner, Kyndra’s coming of age ceremony ends with the relic destroyed and the village in chaos. Even worse, an impossibly powerful storm almost tears the village apart and she’s only saved by Bregenne and Nediah, two travellers who know far more about her than they’re letting on. Unable to return home, she journeys with them to Naris, the home of their order, to find out the truth about herself, the world and her future. A future that is far more uncertain, and powerful, than she could imagine. Lucy Hounsom’s debut is no less powerful than her lead character’s but infinitely more controlled and confident. This is epic scale fantasy that never loses sight of the people at its core, their reactions to events larger than they are and the consequences and complexities that go hand in hand with those reactions. Kyndra in particular is an eminently likable, fundamentally sensible lead who has none of the ‘invincible snowflake’ problems that sometimes afflict characters in books like this. She’s tested in ways you will not expect here, several of them genuinely horrifying and Lucy does an incredible job not only of showing the consequences of that but the calcified cultures of both Kyndra’s home and Naris. The first is content to know the future at every turn. The second is desperate to know its future is secure and will risk the lives of countless innocent young people to ensure it does. That cultural clash, and the hints of other places we see between the two, are amongst the most interesting and nuanced worldbuilding I’ve ever come across in a fantasy novel. It’s also refreshingly morally complex. There are villains here, but none of them are single-note. Instead, everyone’s agenda is understandable if far from sympathetic. Even better, the moment where Lucy pulls the curtain back to show just how those agenda interact is just amazing. Again, some fantasy novels can fall apart in the third act. This one accelerates, raising the stakes and pace to a level no one, you or the characters, will see coming. What’s even more impressive is how each of those characters has a rich internal emotional landscape to match the complex ethical one they navigate. Kyndra’s just the centre of a group of characters who arrive fully formed and demand your attention. Kyndra’s classmates are especially good fun but its Bregenne and Nediah who will stay with you. The Wielders, this universes’ magic users, are a complex and refreshingly fractious group whose strengths and weaknesses are embodied in the two. Bregenne’s powers are linked to the Moon, Nediah’s to the Sun and they’ve been linked to ensure they can always protect each other. Whether their inevitable intimacy is as a result of that or of genuine attraction is the other dramatic engine of the book and it’s a V8. The pair’s scenes crackle with tension, sometimes romantic, sometimes not and always there. They embody the best and worst of the Wielders, often at the same time and their journey is as complex and emotional as Kyndra’s. 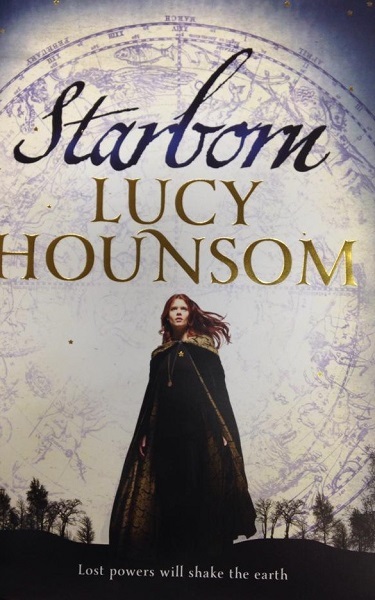 Starborn is an extraordinarily ambitious, immensely successful fantasy novel that works on every level. Lucy has created a world that’s complex at every level and explores each one of those levels as the story expands. It’s immensely ambitious, deeply personal and absorbing. Kyndra’s future may not be certain, or bright, but based on this first volume it’s certainly going to be eventful.